I have never had baked beans from a can. Recently a baked beans discussion was had, the collective opinion of which was that you either loved them, in all of their processed and canned glory, or that they belonged right where they came from: packaged and sealed in a dust-collecting shelf of a convenience store. My opinion hardly mattering due to the non-existent relationship that said beans and I share, I decided to do a little baked bean pondering. The beans themselves are not the offensive variable for which the conversation took place. It is the method through which they come to fruition that repulses us foodie purists so. To the kitchen I went. 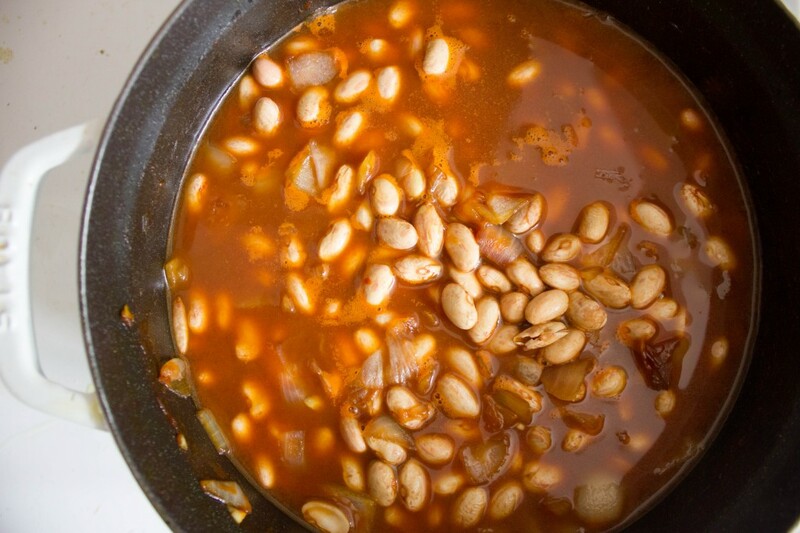 Pinto (Spanish for “painted”) beans are so named because of their splotchy, paint-strewn-on-a-canvas-like appearance. 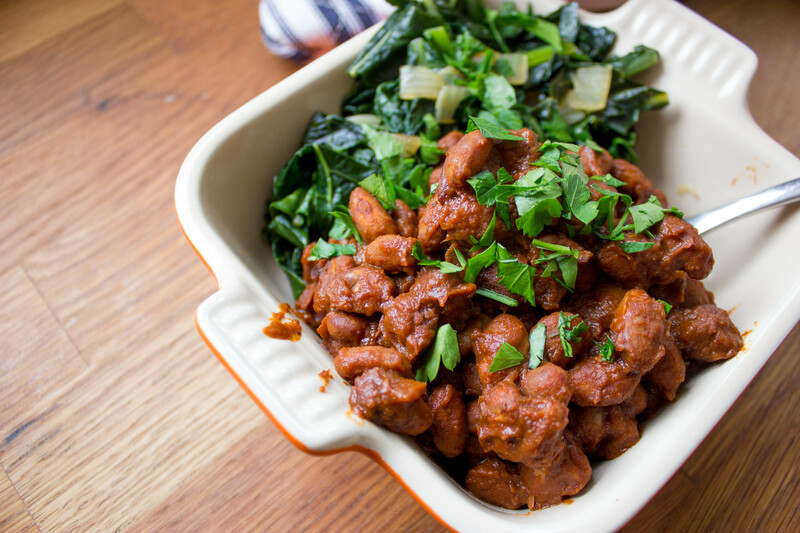 They, like most varieties of beans, contain high levels of fiber that help maintain healthy cholesterol levels and satiety long after consumption. 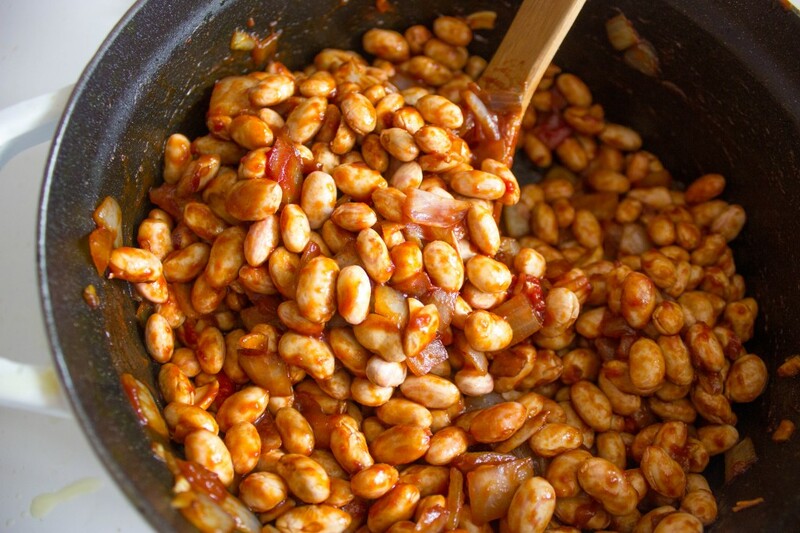 There are 15 grams of fiber in one cup of pinto beans! They also contain folate, magnesium, B vitamins and even iron. 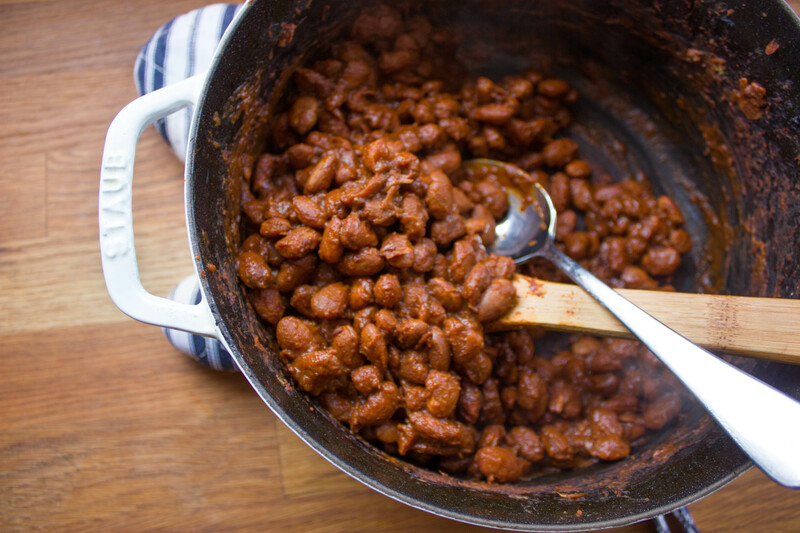 If you don’t have pinto beans on hand, cranberry, red kidney, lima, and navy beans are all good substitutes. 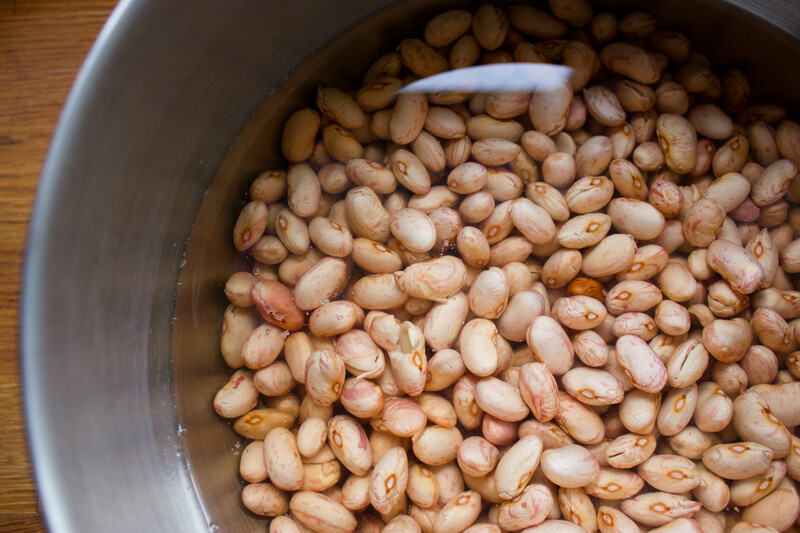 As the beans simmer and absorb the cooking liquid, watch how the painted splotches disappear in favor of a light pink color. This marriage of ingredients is something that can’t be observed when you purchase packaged foods. At the risk of sounding like I’ve climbed up into the pulpit, there is a beauty that exists in simple, conscientiously-prepared ingredients. Food is not meant to be scarfed down over a thirty minute segment, nor is it meant to be daunting or grandiose. These are just beans after all! 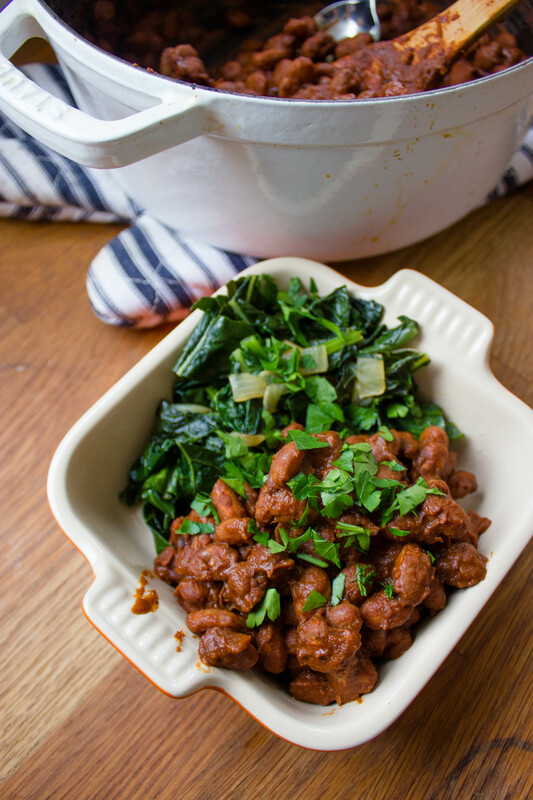 And with a tad bit of thinking ahead, an easy, healthful dish can be yours for just $3.99! No but really, these are so good. 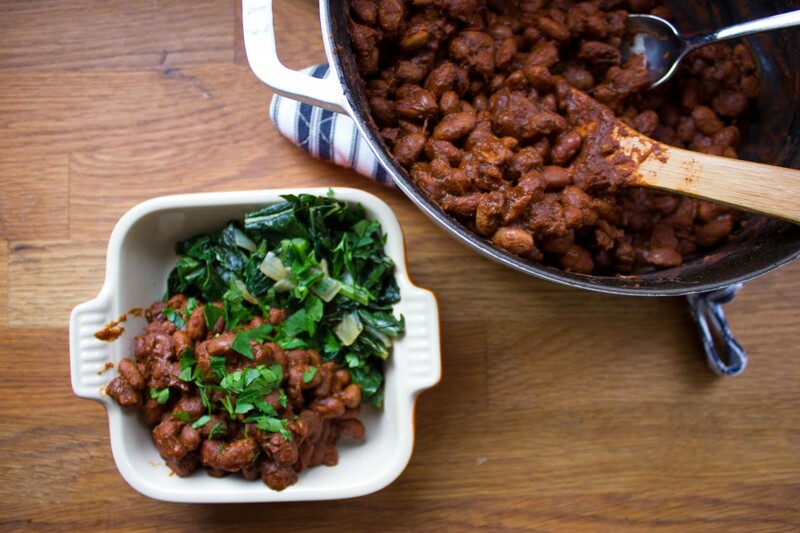 Serve them with some greens and some grains all week long. Place a cast iron dutch oven on the stove over medium heat and add the oil and onions, cook for 5 minutes. 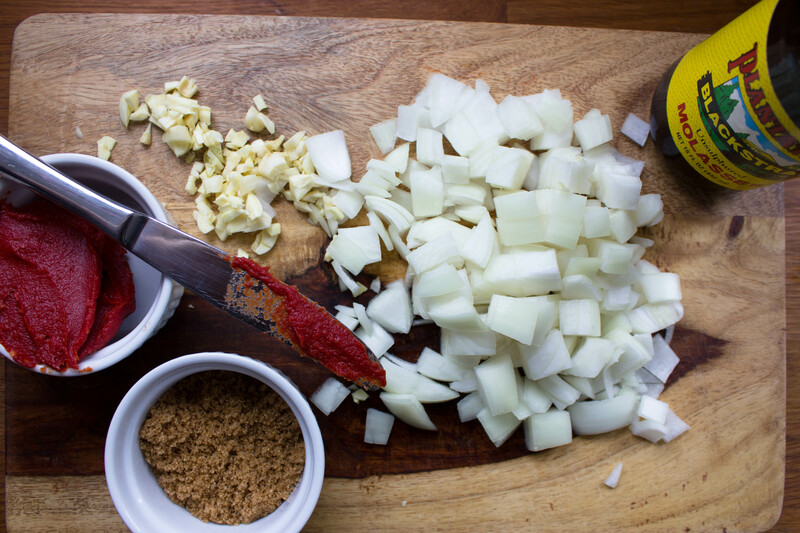 Â Add the tomato paste, brown sugar and molasses to the onions and stir. Â Add the beans to the onion mixture. Measure out 4 cups of vegetable broth and add to the dutch oven. Bring to a boil. Then add the cayenne pepper, cumin, pepper and salt, stir and cover with the lid. Make sure there is a seal and place the dutch oven in the oven. Cook for 6 to 8 hours, taste to test their readiness. Note: this recipe is hard to screw up. In one of my batches, I left the beans in the oven too long and they dried out. I added 1.5 cups of water and put the beans on the stove over low heat until all the liquid was absorbed. Barely adapted from Alton Brown’s recipe here. As much as I hate to admit it..I really like baked beans from a can. I should try making it at home. This looks SO good!